At the Sussex Biodiversity Record centre we are continually updated by Sussex Biological recorders on changes to Sussex Wildilfe. many of these are attributed to climate change and some to other factors. We want to use this blog to keep people up to date on the changes we see and invite comments, theories and speculations on why these changes may be happening. Tony Russell, former Head Forester of the National Arboretum at Westonbirt was on BBC's Gardener's Question Time today and suggested that we should all be planting non-native holm oak, sweet chestnut, and walnut etc. rather than beech and other species that might be susceptible to climate change, especially drier conditions. This is reinforced by the Royal Horticultural Society who say on their web site. "In the south and east, gardeners should stop planting beech for the long term, either as specimen trees or hedges. Tree of heaven, holm oak and eucalyptus will suit the site better now and are likely to pull through whatever climate change brings." While it is true that many of our native plants may suffer in hotter, drier weather, I wonder if climate change predictions are really sufficiently robust to prescribe that beeches and other long-lived native species should no longer be planted. Tony Russell pointed out that beeches tend to flourish on thinner, drier soils: maybe they will do better on heavier, wetter soils in the future. Yesterday, 22 March, the flower above opened on a plant of Taraxacum pseudohamatum growing in our garden in Sedlescombe, East Sussex. Last year the first flower on this particular plant did not open until 14 April, so it is running 23 days earlier than in 2006. There are all sorts of reasons why this might be the case and I somehow doubt that it has anything to do with long-term climate change. Maybe, for example, it was responding to conditions last autumn, maybe dandelions flower earlier as the plants get older, maybe it has, or has not, been suffering from the attentions of some predator above or below ground. Taraxacologists might like to note that I have identified this dandelion microspecies using the BSBI's Handbook The Dandelions of Great Britain and Ireland by Dudman and Richards (2000 edition). Hours of endless fun there. What species would you choose to monitor climate change? The question is frequently asked but, as the discussion develops, people seem less and less sure that an increase or a decline of taxon x or y has anything to do with climate change at all, either directly or indirectly. So, we want to hear from you as to the species common or rare you might (we stress might) monitor on a long-term basis to see if their fortunes had anything to do with global warming, or cooling, increased storms, tidal surges and so forth. 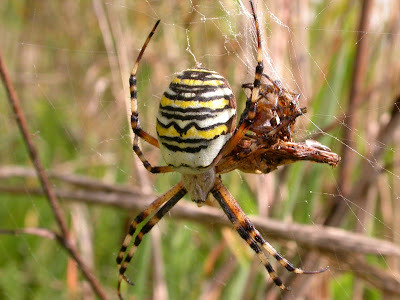 Does the arrival and northward spread of the wasp spider (Argiope bruennichi) have anything to do with warmer summers, milder winters, an increase in grasshoppers, or did it simply hitch a ride across the Channel and spread across England just because it is here? The first UK record for this species was from Rye in East Sussex in 1922, so it has taken a long time to get going. But maybe it has been introduced more than once and it is only the more recent arrivals that have managed to spread. Is this likely to have anything to do with climate change or not? And if it is, how can we prove it?